Adaptation of Stephen King's long running fantasy series. I haven't read any Stephen King since the late '90s, but over the course of that decade I consumed everything the author had produced to that point. Everything aside from his ongoing fantasy series The Dark Tower that is. Having a general aversion to the fantasy genre, and due to the time I would have to devote to complete its numerous volumes, it was always at the bottom of my King 'to read' list, and I never got around to it. Something tells me the people who made this film of The Dark Tower never got around to reading the books either. Totalling eight books to date, The Dark Tower series offers a wealth of material for adaptation, and seems like a gift for a Hollywood system obsessed with establishing long running franchises. Yet the movie we've been given isn't simply an adaptation of the first book in the series, The Gunslinger, but rather an appropriation of the series as a whole. Not since 1965's The Greatest Story Ever Told, which took the bulk of the Bible's New Testament as its source, has such a large chunk of literature been so tightly condensed. The Greatest Story Ever Told was a whopping 260 minutes long however, while The Dark Tower is merely 95. With so little time to explore King's epic narrative, the movie narrows its focus to present a story so generic it feels derivative of every other failed Young Adult franchise starter that's been foisted on us over the past decade. The titular monument is a structure located at 'the centre of the universe', one which prevents the malevolent forces of Mid-World, led by The Man in Black (Matthew McConaughey, wearing an outfit borrowed from a second rate magician), from entering our world. Despite this, Black has somehow managed to send what seems likes thousands of his minions into our world, populating every major city in search of earth children who possess psychic abilities, known as 'Shining' (yep, the very same). One such kid is New Yorker is Jake Chambers (Tom Taylor), who has been having visions of Mid-World, The Man in Black and another mysterious gun-wielding figure in his dreams. 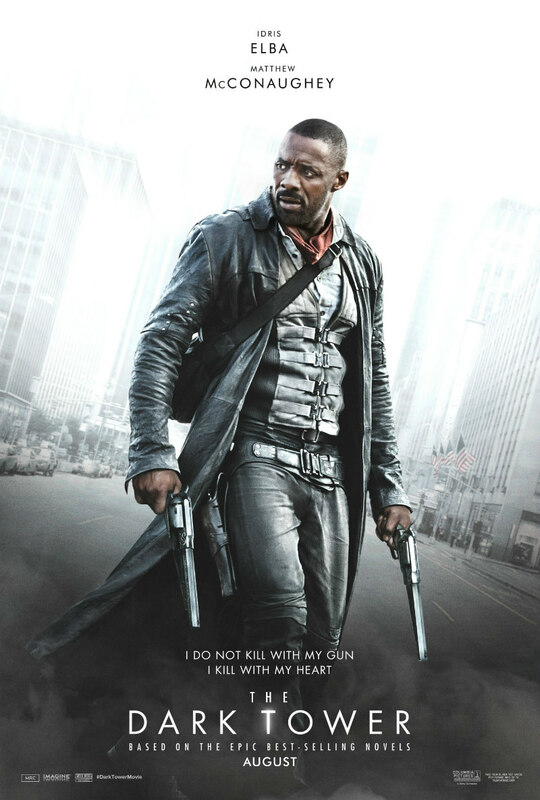 Locating a portal in his city, Jake makes his way to Mid-World, where he teams up with The Gunslinger (Idris Elba), the one man who seems capable of stopping Black, to locate Black's Death Star-like lair and foil his plot to destroy the Dark Tower. 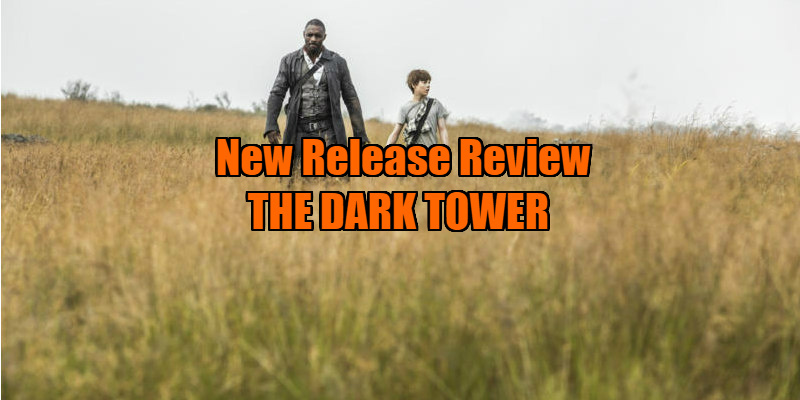 Shot with small screen blandness, The Dark Tower plays like the pilot of a TV show that never got picked up by its network, which then awkwardly added an ending to wrap it up and put it out as a one-off TV movie. It spends roughly the first hour throwing garbled information about its universe at us, as though it's laying a path for an entire franchise, only to end in a wrestling match between its hero and villain. Imagine a straight to video knockoff of both The NeverEnding Story and The Terminator, and you'll have an idea of how generic this is. Like so many post-apocalyptic landscapes portrayed on screen, Mid-World is lazily based on the Old West, but it fails to even make anything of this potentially interesting setting. The film wakens from its slumber for a 10 minute period when Jake brings The Gunslinger back to modern day New York and we have a diverting fish out of water segment, with Elba riffing on Spock in The Voyage Home. He may be adopting an American accent here, but Elba delivers insults like "you have forgotten the faces of your fathers" in a way only a British actor can. McConaughey has a few fun moments too, like when he's discovered cooking a meal in Jake's mother's kitchen and excuses himself with the claim that "We don't have chicken where I come from!" Thanks to its adult leads, The Dark Tower offers just enough to suggest that, had it been adapted by anyone who gives a flying one about this material, it could have been an enjoyable fantasy diversion. As McConaughey might say, it's not quite awful, awful, awful, but neither is it quite alright, alright, alright. The Dark Tower is in UK/ROI cinemas August 18th.